G4 VERSION Yet Again! We have decided not to rest on our laurels and have improved the already functional design of the Base kit to address the one area we felt could use it. The sheet metal has been revised to allow more clearance and eliminate spot welds while adding stiffness. The shock alignment has also been addressed and these small adjustments make this our best fitting kit yet. The ball studs for the strut attachment are welded on to reduce hardware and clean up the appearance of the whole kit and simplify install. The Base Kit was the first FIGS product. It has been an international hit as it also fits the other IS300 relatives: the Japanese Altezza, the IS200 and the RS200. This product was originally driven by the failure of the factory hood prop stick retainer (plastic clip) as well as the need for a quality "factory looking" solution to match the reputation of the luxury auto maker. FIGS utilizes OEM quality materials and finishes to ensure a long product life and great looks for years. 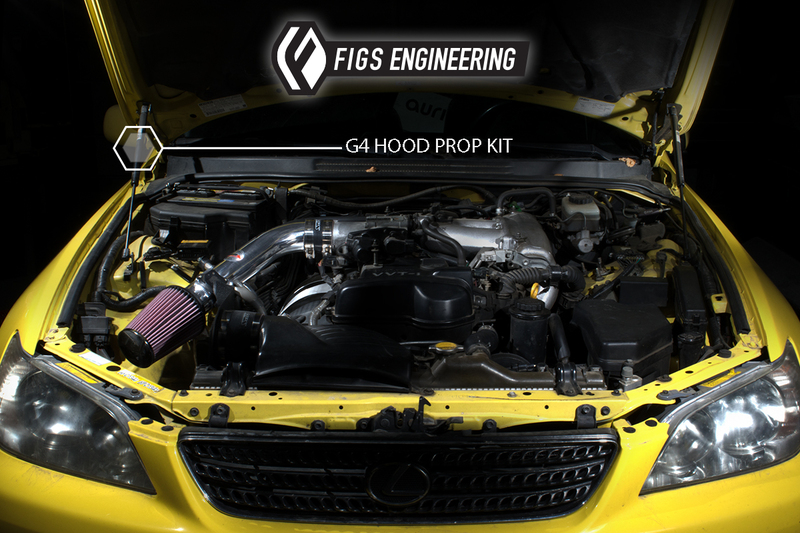 Functional and well integrated, the base kit offers gradual support of the factory hood from approximately 30% to 100% hood travel. The factory prop stick is removed and the freedom to work within the engine bay is granted with the installation of this kit. Current applications for OEM and Carbon Fiber hood weights, select before ordering. Laser-cut, welded and formed steel and aluminum bracketry finished with black powdercoat for long-lasting great looks. Completely bolt-on, installs in 20 minutes and requires NO DRILLING whatsoever. Hood weight is supported at the factory hinges. OEM trusted Stabilus(tm) brand struts. 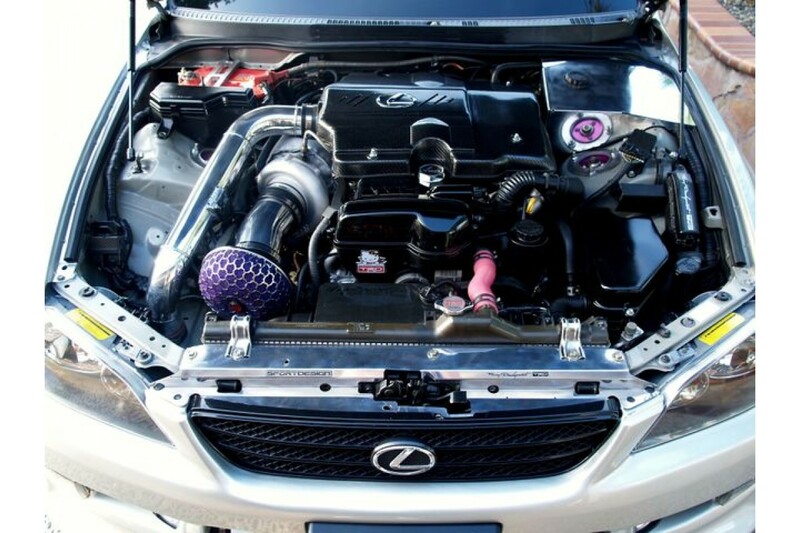 No other brand is used in more OEM applications in the world. Gradual progressive support from 30-100% hood travel. Operates in temperatures below 0 degress (F). 2 year warrantee on struts, 90-day on bracketry against defects. 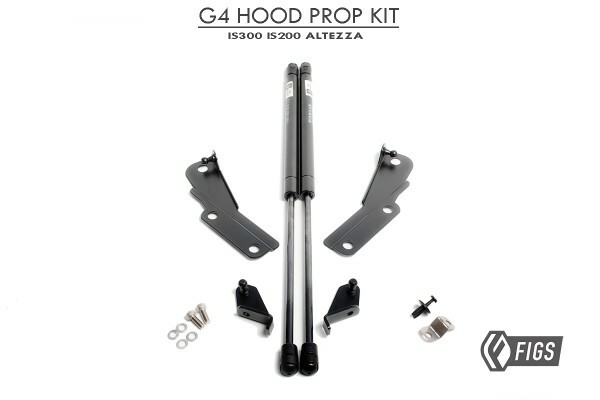 2 Hood-side brackets that mount using the factory hood hinge bolts with integral welded ballstud (G4). 2 Wheelwell brackets with Stainless Steel socket head screws and lock washers with integral welded ballstud (G4) . HEADERS MADE TO ORDER - LEAD TIME 5 WEEKS OUT AT THIS TIMEWe have had a vision of a perfect heade..